Sari Heinsman, Olivia Baldeo and Fleurie Oenema. We come from Arnhem, the Netherlands. We all study fashion design. At the college we have been working with the opera project – no other project outside the college. We all three have been working on a bridal costume but everyone has had their own responsibility individually. We arrived in mid-November 2013 and will leave in the beginning of February, altogether 11 weeks. Do you think the time has been too short, too long, just perfect? The time period has been just perfect, long enough for learning new things. Actually we have stayed only 9 weeks in Jyväskylä because we went home for 2 weeks over the Christmas holiday. How did you prepare for the stay/exchange to Finland? 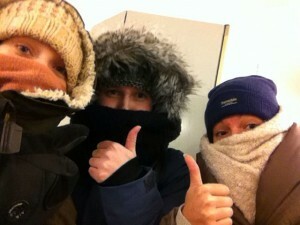 We bought very warm clothes, not any other preparation. Our teacher that came here last year told us about the college and the department but that’s it. First weekend we stayed in Helsinki and had a look at the capital, it was very nice..
First week we made corsets and it was interesting because we haven’t done that before. After Christmas we started the bridal dress project and in that project we’ve had to figure all out ourselves, not much help from other students or the teacher. Partly it’s good because you get responsibility but sometimes it would be nice if the teacher had more time for us. We have also noticed that people are really nice but do not really take easily contact. Jyväskylä is a really clean and neat city. – Minimani is a really good shop – you can find everything there. – Escape club and Freetime are good clubs (if you’re over 18). – Crafts museum was nice but small and not a lot of English explanations. – Our school should have talked a bit more about the college and that we would only have one teacher. In our college we work all the time with many teachers so this experience has been quite different. -The dorm room is nice but quite expensive – it would be nice to have a couch and a tv for exemple. More information for students coming to Jyväskylä College http://tiny.cc/incoming_students and Milka Niskanen, International Coordinator (@jao.fi).